One of the reasons I'm smiling so widely in this picture is I'd just been talking to the people in Azraq camp who run the child friendly space it was taken in. They were mostly from UNICEF. They had explained that when the kids arrived in the camp, only the previous week, they didn't talk or make noise. They were subdued. When they drew pictures, the pictures were of explosions, of severed body parts, of weapons and dead people. The camp had only been open two weeks. The kids I saw and spoke to were kids – noisy, happy, curious, hilarious, and they showed us their drawings, of butterflies and children and mountains and animals and hearts. That's what I'm smiling about. That room full of noisy kids was the best place in the world. I spoke to some of these children, who told me about their lives in Syria during the troubles, about their escape (“there were rocks in the desert, and we had to turn on the headlights to see, but when they turned on the headlights of the car people would shoot at us, and my parents were frightened, but I wasn't...”). For some of them it had been three years since they last went to school. I made the mistake of reading some of the comments in the Guardian article, and on Twitter, who seemed convinced that me talking about the kids in the camps was a sentimental attempt to take their attention from the real business at hand, which was supporting whichever side in the conflict you already supported loudly and vocally. Obviously, a political crisis that's bad enough to produce refugees is only going to be sorted out politically. But pretending that people hurt, displaced and fleeing are just a vague sort of irritant, that lives wasted or destroyed don't matter, in order to prove your ideological point, whatever it happens to be, is, to my mind, both lazy and foolish and very, very wrong. 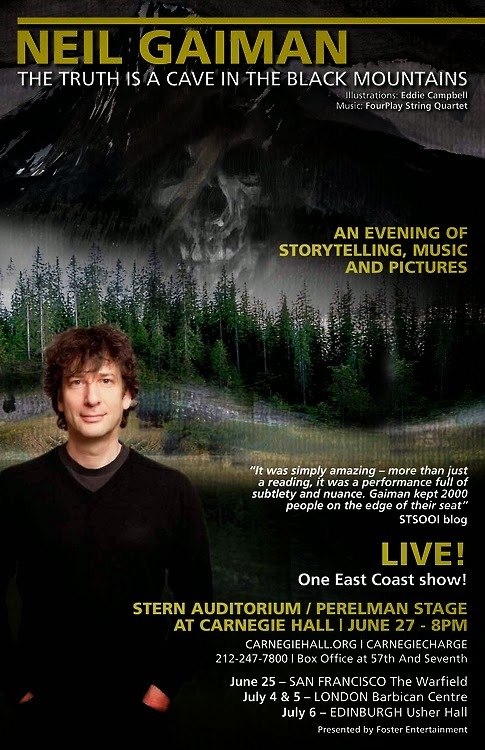 This is the poster for TRUTH IS A CAVE IN THE BLACK MOUNTAINS Reading Event at the Carnegie Hall (and it lists the other gigs too. I think there may still be a handful of Barbican tickets available on July 4th and 5th, I'm pretty sure the Warfield is Sold Out, although they may release a few closer to the date, and right now Usher Hall in Edinburgh, which was the last concert to go on sale, still has plenty of seats, and even has some in the Stalls). 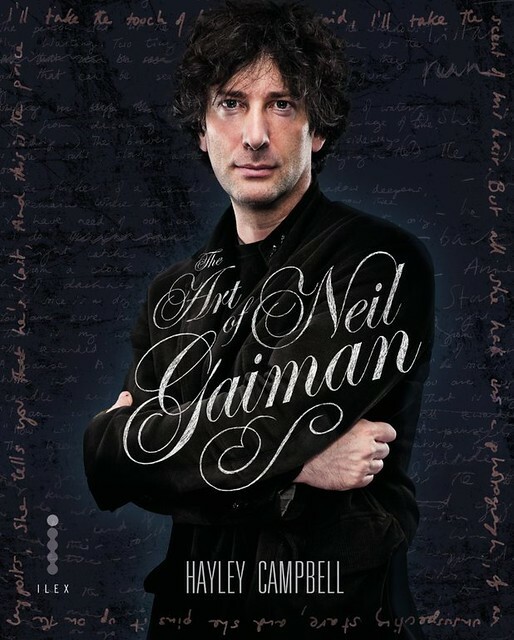 Enter for your chance to win one of five pairs of tickets to see Neil Gaiman live at Carnegie Hall with FourPlay String Quartet on June 27th! Prize package includes a meet & greet and photo opp with Neil himself. Honestly I think I have to burn the tapes. I read the book a few months ago, and really liked it, as much as it's possible to like something where one is too embarrassed properly to relax and enjoy it. I was reading it to approve the text, but I loved the text and spent most of my time trying to fix the dates on the picture captions. Hayley is a really funny writer. She's observant and interested. I'm really looking forward to her novel, when she writes it, and am also a little bit scared. Hayley's going to be taking over the role of interviewer from her father, ace illustrator Eddie Campbell, for the Barbican and Edinburgh TRUTH IS A CAVE gigs on July 4th and 5th. There's a really sweet little photo spread and interview in Boston Common magazine about Amanda and me in which they list us as one of Boston's most Stylish Couples. Quite when I slipped into this parallel dimension in which I can be described as “stylish” without anyone in earshot actually sniggering, I do not know. But I am going to make the most of it while I'm here. Important. Please read this now. I haven't blogged for a while. I suspect that's partly because I'm back on Twitter, and I seem either to blog or to tweet, and partly because I've been exhausted. Tweeting time comes out of dead time, usually – time in taxis, or waiting in corridors. Blogging time usually comes out of sleeping time. It's foggy where I am today, and I can't tell where the sky ends and the sea begins. In a few days I go to Norway, to Sweden and to Spain, for a slew of appearances and interviews. Looking over the schedule, I suspect that some of the signings may be hard, as very limited amounts of time are scheduled for them, and immediately afterwards I'm due at the next event or interview or thing. Last week I was in Jordan, and then landed, still shaken up, and went straight to the British Library, where I talked about Sandman and Art and Life with Tori Amos, then got up on the stage and read some stories to an audience, then collapsed. 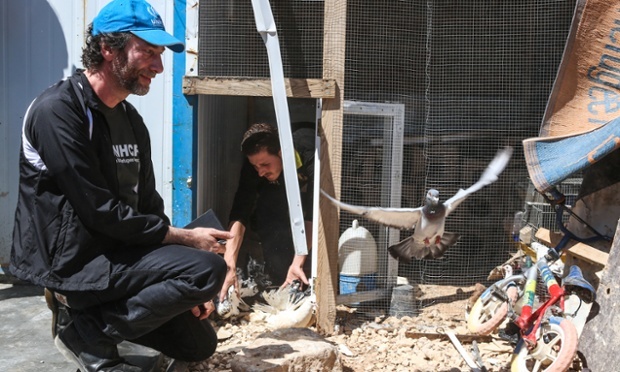 I went to Jordan, as I reported here, for the UNHCR, the United Nations Refugee Agency, to visit the Syrian Refugee Camps and report on what I found. Last year I wrote a short film for Georgina Chapman to direct, and we really liked each other, and she said yes when I asked if she'd like to come with me to Jordan. We had both planned to bring our spouses – I had expected that Amanda would be there but that Harvey Weinstein (to whom Georgina is married) would just get too busy, because Harvey is always busy. Instead, Amanda found herself dealing with a perfect storm of things, including health issues and, most importantly, an unfinished book, and could not come, and Harvey was there, showing a side I've not seen in the 20-odd years I've known him. No Amanda made the Jordan trip easier, as I didn't have any attention on anyone else at any time I was in the camps, and much harder, as I really would have given the earth for a hand to squeeze at some points in the camps, or for someone to hold. I would write about the Jordan trip here, but I wrote what would have been my blog already. 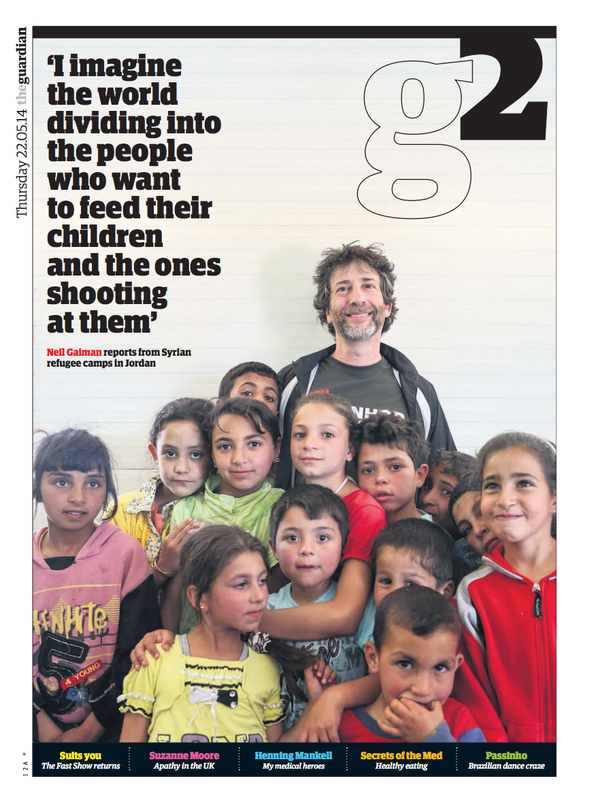 This is the link to the main article, which I wrote for the Guardian. This is the link to the Guardianpictures – I wrote captions to the images, or UNHCR took them from my end of day video diary. And here's an interview I did with the BBC World Service, while I was out there. If I sound a little shaken, I am. Everything is going to be collected at http://donate.unhcr.org/neilandgeorgina, which also gives information on the project and also on how to donate to UNHCR. I came away from Jordan ashamed to be part of a race that treats its members so very badly, and simultaneously proud to be part of the same human race as it does its best to help the people who are hurt, who need refuge, safety and dignity. We are all part of a huge family, the family of humanity, and we look after our family. Please share the links, especially the link to the main Guardian article at http://rfg.ee/x6Kon. Share them aggressively. Make people read them. It's important, and I'll be grateful. Thank you. I landed in Jordan late this afternoon. I'm in my hotel right now. I'll be up for a 6 am pick-up -- I need to be at the camp for bread distribution, first thing in the morning. Since the start of the Syrian warfare, over two and a half million people have fled the fighting and gone somewhere else. Half a million of them have come to Jordan. The population of Jordan is a little over 6 million. By percentage of the population, that's what would happen if twenty five million people arrived as refugees in the US over a couple of years, or five million people sought refuge in the UK. It means lots and lots of people here have Syrian families living with them. It means that there are refugee camps -- small cities built in the desert, all temporary structures. I was invited to come out here by UNHCR - the United Nations Refugee Agency - with the purpose of making one or more short films, telling stories and writing articles that draw attention to what's going on in refugee camps. 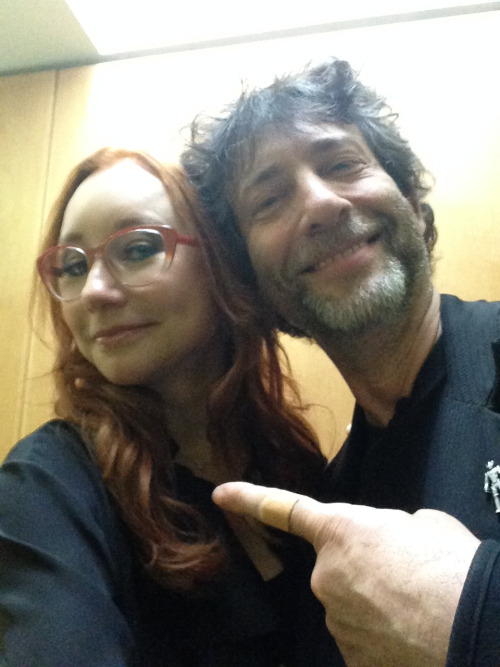 They've created a web page at http://donate.unhcr.org/neilgaiman so that people can follow on and see what's happening. I'm back on social media from today. And my last class at Bard until Autumn is tomorrow night. I owe the world a big post on life and the things that go with it. There are many peculiar places in the world, places that can hold your mind and your soul tightly and will not let them go. Some of those places are exotic and unusual, some are mundane. The strangest of all of them, at least for me, is the Isle of Skye, off the west coast of Scotland. I know I am not alone in this. There are people who discover Skye and will not leave, and even for those of us who do leave, the misty island haunts us and holds us in its own way. It is where I am happiest and where I am most alone. Otta F. Swire wrote books about the Hebrides and about Skye in particular, and she filled her books with strange and arcane knowledge. (Did you know May the 3rd was the day that the Devil was cast out of Heaven, and thus the day on which it is unpardonable to commit a crime? I learned that in her book on the myths of the Hebrides.) And in one of her books, she mentioned the cave in the black Cuillins, where you could go, if you were brave, and get gold, with no cost, but each visit you paid to the cave would make you more evil, would eat your soul. And that cave, and its promise, began to haunt me. I took several true stories (or stories that are said to be true, which is almost the same thing), and set them in a world that was almost, but not quite, ours, and told a story of revenge and of travel, of desire for gold and of secrets. Two men, one very small, are travelling west to find a cave said to be filled with gold. I wrote most of the tale on the Isle of Skye. When it was done it was published in an anthology called STORIES, and it won the Shirley Jackson Award for best Novelette, and the Locus Award for Best Novelette, and I was very proud of it, my story. Before it was published, I was set to appear on the stage of the Sydney Opera House, and was asked if I could do something with Australian string quartet FourPlay (they are the rock band of string quartets, an amazing, versatile bunch with a cult following): perhaps something with art that could be projected onto the stage. I listened to FourPlay's music, and, possibly once I heard their take on the Doctor Who theme and the Simpsons Theme, and a cover of Cry Me A River I liked nearly as much as Julie London's (and I like that so very much), I knew wanted to work with them. 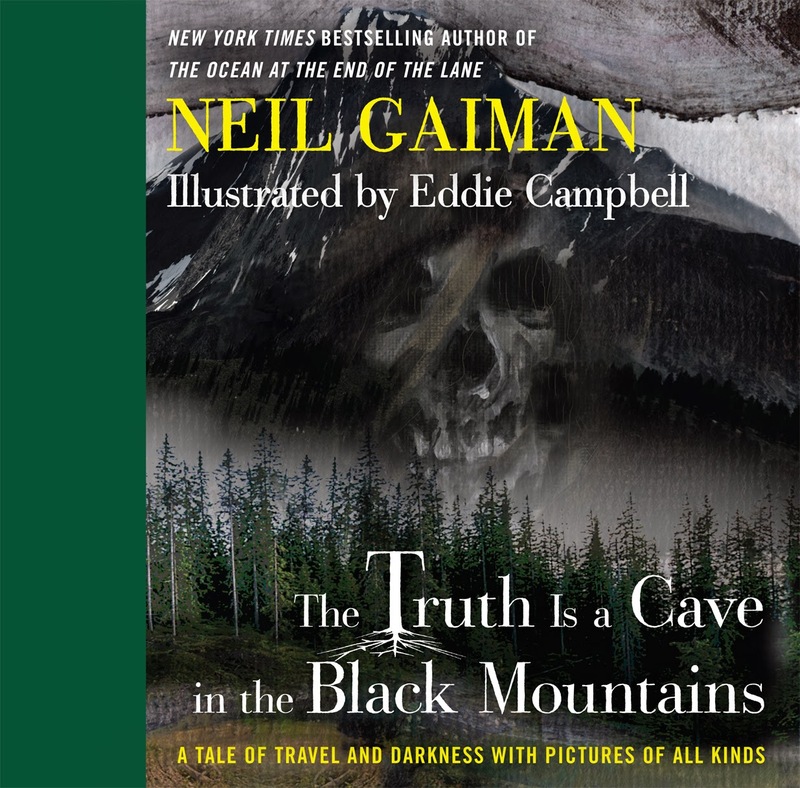 I thought about “The Truth is a Cave in the Black Mountains”: it would take about seventy minutes to read. I wondered what it would would happen if a string quartet created a moody and glorious soundtrack, as I told the story, as if it were a movie? And what if Scottish artist Eddie Campbell, the man who drew Alan Moore's FROM HELL, writer and artist of ALEC, my favourite comic, created illustrations for this most Scottish of my stories and projected them above me while I read? I was scared, going out onto the stage of the Sydney Opera House, but the experience was amazing: the story was received with a standing ovation, and we followed it with an interview (artist Eddie Campbell was the interviewer) and a poem, also with FourPlay. Six months later, we performed it again, with more paintings by Eddie, in Hobart, Tasmania, in front of 3,000 people, in a huge shed at a Festival, and again, they loved it; again, a standing ovation. Now, we had a problem. The only people who had ever seen the show were in Australia. It seemed unfair, somehow. We needed an excuse to travel, to bring the FourPlay string quartet across the world (pop culture literate and brilliant musicians, they are: I fell in love with their work before I ever knew them). Fortunately, Eddie Campbell had taken his paintings, and done many more, and then laid out the text into something halfway between an illustrated story and a graphic novel, and Harper Collins were publishing it in the US and Headline publishing it in the UK. Mysterious promoter Jordan Verzar, who had put me and FourPlay together in the first place, saw his chance and struck, rather like an amiable Australian cobra, and before we knew it, everything was happening. So we are doing the smallest tour in the world for this. If you want to see me performing THE TRUTH IS A CAVE IN THE BLACK MOUNTAINS, with the amazing FourPlay string quartet, and see Eddie Campbell's art projected, the words and the music and the images combining in your head to make a movie that only you will ever experience in that way, a night with special guests, I wouldn't be surprised, and also surprises (including things nobody has every heard read), then the only places you can see it are San Francisco, at the Warfield, New York's Carnegie Hall on June 27th, then in London at The Barbican (two nights) and it ends in Edinburgh, in Usher Hall on July 6th. And then we'll be done. Right now, the Warfield on June 25th is already SOLD OUT. If you've read down this far and you're interested in seeing a unique and amazing evening, and you are anywhere in the US, the Carnegie Hall is the one to come to (unless you want to fly to the UK). New York is nice in June. The two Barbican concerts on July 4th and 5th are almost sold out (they have just released some seats, so there are a few seats left). Usher Hall in Edinburgh was only just added, and tickets only just went on sale. There are lots of seats there, and very much hope the Scots are kind to my Scottish tale. Do come. I know it may seem odd, an author and a string quartet. But trust me, you do not want to miss it. I wanted to put in a huge plug here for the anti-bullying website, Bystander Revolution. They've done some amazing interviews with people, and have advice. Here are their films talking to me.